Clumping litter may pose a hazard, especially to kittens. You and your finicky kitty like clumping kitty litter because it's easy to keep clean, but some kitty owners fear the litter could cause an intestinal obstruction if a kitty swallows enough of it. While scientific research is lacking, you might want to play it safe with your feline friend. Clumping clay litter gets its clumping qualities from sodium bentonite, a clay that expands in the presence of water. If your furry friend winds up consuming a larger amount of this clay than her tiny digestive tract can pass, the clay supposedly could swell in her digestive tract, possibly creating an obstruction. Manufacturers deny the litter is a hazard, and scientific research to settle the question is lacking. The evidence supporting this theory seems largely anecdotal. Some kitties try eating cat litter purely out of curiosity. This is most common in kittens just learning about their environment. A condition known as pica, which is an abnormal craving for a non-food substance, may cause an older kitty to eat clay clumping litter or other inedible things, according to VetInfo. When she's grooming herself, your lovable pal may also swallow small amounts of litter that is clinging to her fur. Small amounts of swallowed cat litter can pass out harmlessly in her stool, but many owners fear too much of the clumping kind may cause a blockage. Watch for behavioral clues that your beloved kitty is suffering from an obstruction. She may seem lethargic or refuse to eat. You might notice that she has not had a bowel movement for several days. If you notice that Princess is not her usual playful self, take her to the veterinarian immediately and tell him she may have ingested clumping litter. Your vet will probably take an X-ray of her gastrointestinal tract. Obstructions typically require expensive and invasive surgery to fix. Felines sometimes snack from the kitty litter box out of boredom, says Dr. Jeff Nichol, a practicing veterinarian in New Mexico. If your kitty is bored and is sampling the litter box, get her a kitty tree with lots of dangling feathers or balls to play with. Adopting another cat or getting Princess a pet fish also may be enough to distract her curious side. If she continues to sample her litter, change it more often. See if a scented litter or other alternative type of litter is less appealing to her palate. If Princess has been hospitalized for an obstruction caused by ingesting clumping litter, you'll probably want to switch to a different type of litter. Shredded newspaper or special pellets made from recycled newspaper are less likely to create obstructions. Some cats are finicky about changes in their litter, so you might have to mix her old litter with her new litter for a while until she adjusts to the new stuff. 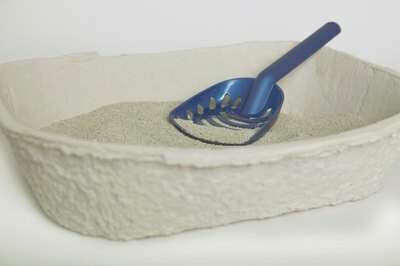 VetInfo: Is Clay Litter Bad for Cat Health?